Wisely leaving behind the "swords and sorcery" aspect of their previous work, Steel Attack return with a rousing power metal album that will please any fan of the genre. Surprisingly, they do so with a nearly completely new line-up. Of course, there have been two albums in between "Where Mankind Fails" and "Enslaved," so that may not be so surprising. The lyrical difference is the most obvious change in the band since "Where Mankind Fails." Whereas that album contained still more of the now-tiresome fantasy adventure epics, "Enslaved" focuses instead on religion and more personal beliefs. Don't misunderstand - "Enslaved" is just as epic an album musically as "Where Mankind Fails," but the context of the songs isn't so ... well, cheesy. Vocalist Ronny Hemlin doesn't have quite the epic pipes that Steve Steel did, but - interestingly - he does sound more like Kai Hansen than Bruce Dickinson. How's that for a change? As mentioned above, the music is still as strong as ever, despite the line-up changes. The songs are built on powerful riffs and chords, the leads are still sharp as hell and everything sounds bigger than life. In general, most of the songs are heavier than most power metal bands, although never too much so. If there's any problem here it's the same problem that many power metal bands share today - they tend to all sound the same. Although I thoroughly enjoyed "Enslaved," I couldn't help but think that it didn't break any new boundaries. Nor does it have to. The band's fans know what they expect and Steel Attack has given it to them again. Steel Attack: Johan Jalonen - guitar; Mike Steel - drums; Ronny Hemlin - vocals; John Allan - guitar; Anden Andersson - bass. For more information, check out http://www.steelattack.com. Steel Attack are a precision power metal band from Sweden who give fans of that particular genre what they're looking for and then some. Monster riffs, sizzling syncopated solos and epic stories told in song form (with titles like "Dragon's Skull," "Island of Gods" and "Thunder Knight"). That's what Steel Attack is all about. When I say sizzling solos, I'm not exaggerating. Built upon thunderous racing rhythms, the solos on "Where Mankind Fails" speed along so quickly - yet so precisely - that they almost sound like heavy metal violin solos. Dual guitarists John Allen and Dennis Vestman ricochet off of each other as did K.K. Downing and Glenn Tipton when Judas Priest was at the top of their game. Vocalist Steve Steel may be more Bruce Dickinson than Kai Hansen, but that's not necessarily a bad thing. 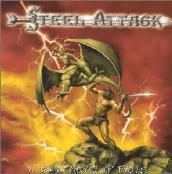 Steel's vocals give Steel Attack a true voice of their own in the world of power metal. 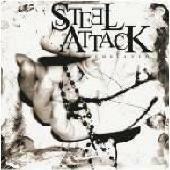 Steel Attack: John Allen; Andreas de Vera; Steve Steel; Dennis Vestman. Also performing on "Where Mankind Fails" are Daniel Nummelin - keyboards; Peter Kronberg - additional choir vocals; Lenny The Rose - additional choir vocals and guest vocals on track 3; Jonathan Oke (guitar fills on track 7).